A man opened fire on sheriff’s deputies through the front door of his mobile home after he called them to report an argument between himself and a neighbor in the unincorporated county area of East Valinda early Friday, authorities said. 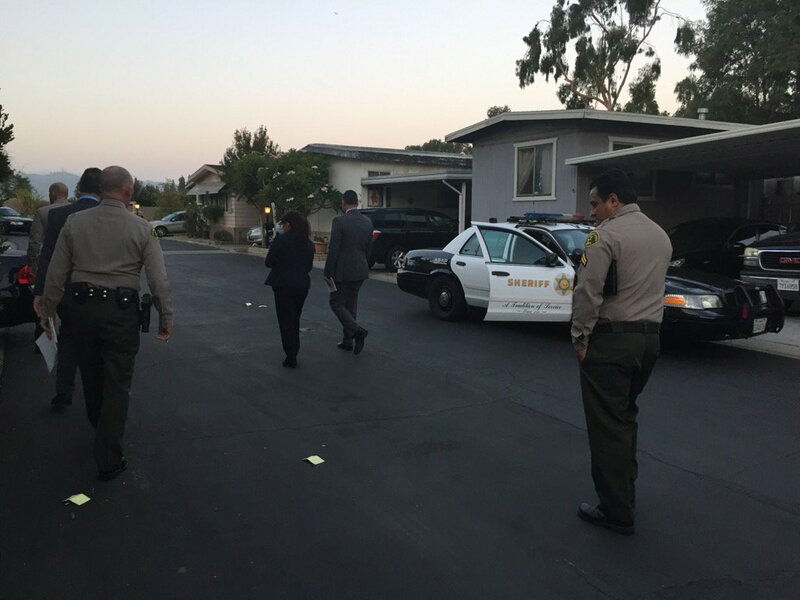 Deputies returned fire, but ultimately took the suspect into custody without injuries to anyone, according to Deputy Joana Warren of the Los Angeles County Sheriff’s Department’s Information Bureau. The incident began as a reported argument between neighbors revolving around a plant along Temple Avenue, just east of Azusa Avenue, the deputy said. The suspect himself called deputies, then ambushed them when they responded to his call for help. Neither the suspect nor the deputies were struck by the gunfire. Deputies ordered the shooter to exit the mobile home and surrender, and he complied, officials said. He was taken into custody without further struggle. Officials recovered a handgun and a shotgun from the man’s mobile home, Warren said. It was unclear which weapon he allegedly fired at deputies. The suspect’s name was not released Friday afternoon as detectives continued their investigation, Warren said. He was described as a man in his 50s. He was booked on suspicion of attempted murder and was being held in lieu of $1 million bail pending his initial court appearance, she said. Detectives from the sheriff’s Homicide Bureau , which routinely investigated deputy-involved shootings, are spearheading the investigation. Anyone with information is urged to contact the sheriff’s Homicide Bureau at 323-890-5500. ROSEMEAD >> A bicyclist escaped with minor injuries following a drive-by shooting in Rosemead early Sunday, authorities said. The shooting occurred about 12:30 a.m. as a 43-year-old El Monte man was riding a bicycle east along Garvey Avenue, near Walnut Grove Avenue, Los Angeles County sheriff’s Sgt. James Long said. The victim saw a white full-size pickup truck pass by, also heading east, the sergeant said. An arm emerged from the passenger side of the truck before the victim saw flashes and heard the sounds of gunfire. He suffered grazing wounds to two of his fingers, Long said. The attack caused the victim to crash his bike, and the attackers sped away. Long said the man rode to his home in El Monte before notifying authorities of the shooting. The motive was unclear. Any witnesses, or anyone with information can reach the sheriff’s Temple Station at 626-285-7171. Tips may also be submitted anonymously to L.A. Regional Crime Stoppers at 800-222-8477. PASADENA >> A man showed up at a Pasadena emergency room with a gunshot wound to his arm late Thursday, police said. The shooting was first reported just after 7 p.m. when the victim arrived at Huntington Hospital, Pasadena police Lt. Jesse Aguilar said. A Duarte man in his early-20s had been shot at least once in the arm, he said. But the location and circumstances of the shooting remained unclear, according to the lieutenant. The victim and several others who accompanied him to the hospital provided conflicting information about what happened and did not appear to be cooperating with investigators. A drive-by shooting in Norwalk on Wednesday afternoon left a man wounded, authorities said. The gunfire was reported about 2:35 p.m. at Pioneer Boulevard and 163rd Street, Los Angeles County sheriff’s Lt. Robin Limon said. Two men, both men in their 30s with suspected gang ties, were walking down the street when an attacker passed by in a white Dodge Caliber, Limon said. Without uttering a word, the driver opened fire with a handgun, striking one of the victims in the leg, according to the lieutenant. The second victim escaped injury. Deputies initially described the suspect as a Latino man in his 30s with black hair and tattoos on his neck. He was armed with a semi-automatic pistol. Limon said the gunman was last seen driving south on Pioneer Blvd., toward the 91 Freeway. A man intentionally struck his girlfriend with an SUV in Pico Rivera late Saturday, shattering her leg, before being arrested at his South Gate home, according to officials and witnesses. Daniel Lopez, 25, was ultimately found and arrested on suspicion of assault with a deadly weapon following the alleged 11:50 p.m. alleged automotive attack in the 9700 block of Woodford Street, near San Gabriel River Parkway, Los Angeles County sheriff’s Lt. Ann Devane said. The couple became involved in an argument when Lopez accelerated his SUV forward, briefly pinning the woman between his SUV and a parked van before speeding away, the lieutenant said. Paul Michael Flores, 18, of Whittier said he was passing by the area with his mother when they noticed a man and woman arguing. The man was seated in the driver seat of a Ford Explorer SUV, and the woman was standing outside the vehicle. As the dispute continued, the SUV began inching toward the woman, who began shouting, “No, no! Stop!,” Flores said. “That’s when he hit the gas and ran into her,” the witness said. The woman was briefly pinned between the SUV and parked van before the driver fled, and the woman fell to the ground. “I called 911, made a U-turn, came back,” Flores said. The young man and his mother did their best to comfort and call the injured woman while relaying the information she told them to sheriff’s dispatchers via cell phone. Deputies and paramedics soon arrived, he said. The woman was taken to Los Angeles County-USC Medical Center in Los Angeles for treatment as deputies investigated the incident, according to Devane. Upon learning the suspect’s identity, deputies asked South Gate police to check Lopez’s home, Devane said. Officers found him sitting in his parked SUV in front of his home and took him into custody without a struggle. According to county booking records, Lopez was being held in lieu of $80,000 bail pending his initial court appearance.